When painting with watercolors in my style, the under-painting (initial wash), is very important as it holds a painting together. The under-painting must be tonally correct or the painting will never look quite right. 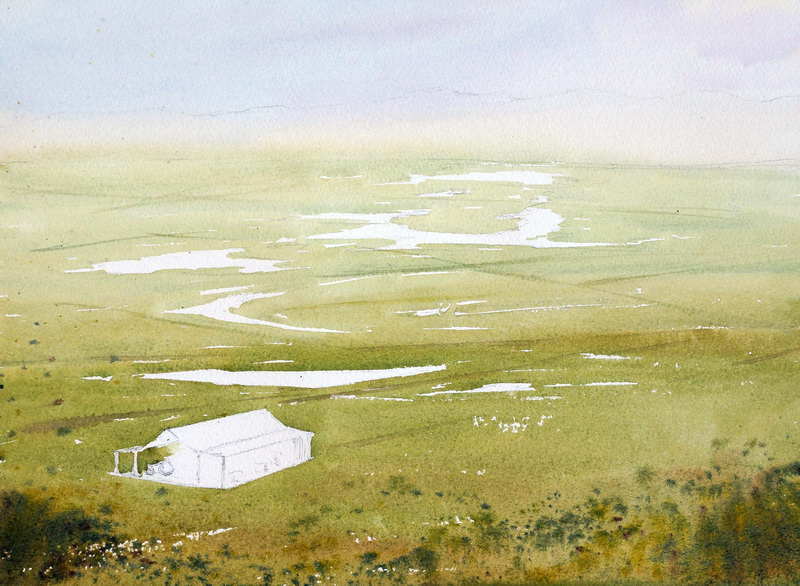 When I am painting a landscape, at the under-painting stage, the scene should already look like a landscape. The sky and ground should be obvious. In this way, all I need to then do is add the objects that sit on the ground. 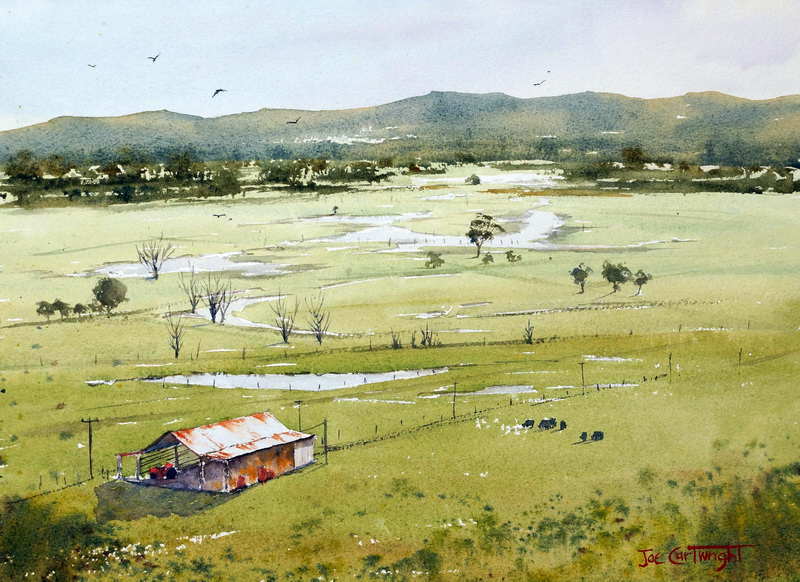 In the following image of some farmland, after it had been raining, you can easily see that it is a landscape with the sky and ground almost fully established. In this scene, I particularly liked the pattern of ponds which were formed after 4 days of rain. The ponds were not panted at this stage however because they would be painted once the objects e.g. trees, cows, fences, which will be reflected in them, are placed on the ground. Here is the finished work. As you can see, the ground has had little more done to it other than the placement of hills, trees, fences, buildings, and animals. This brings up the subject of aerial perspective. This form of perspective is created by the atmosphere and its effect on light as it passes through it. Basically, “like” objects in the distance are lighter in tone, cooler (more blue), duller (less bright), and softer than objects which are closer to the foreground. The word “like” is very important in the previous sentence. It means that green grass in the distance will be lighter, cooler, duller and softer in shape than grass in the foreground. The same applies to trees in the distance vs trees in the foreground. Likewise, for all other objects, e.g. buildings, hills, fences. You can’t compare the ground tone, with a tree however, or with a building. These are not “like” objects. This same principle applies when painting street scenes. In my work, the under-painting results in the highlights which I leave on the surface of buildings, often hinting at windows, and white frames. Remember, white, immediately takes on other colors which are reflected onto it. Hence the sky color, with which the under-painting tints the buildings, will be reflected in the light areas of the buildings. If you look at the under-painting of the street scene below, you can see how this is put into effect. I often have a cool side to a street scene, which has more blue in it, and a warm side which has more yellow or in this case very weak Cad Orange (Winsor and Newton brand). 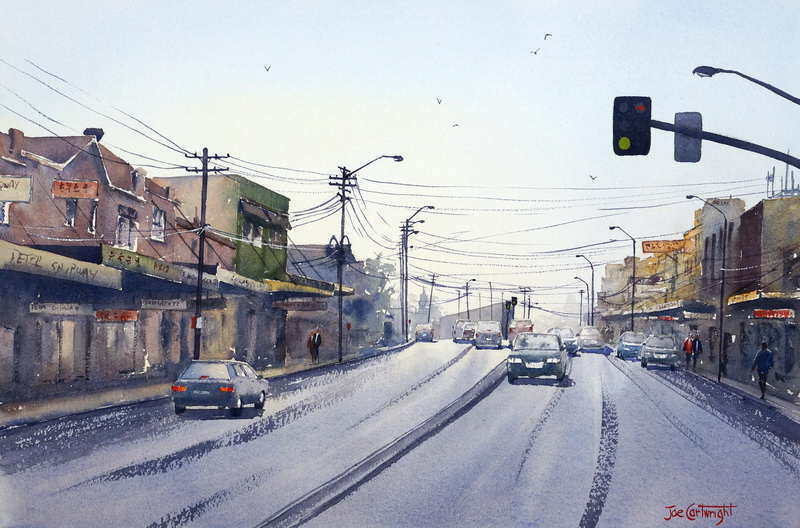 In this watercolor painting, I painted the sky down to street level, and then painted the road while the sky was still very wet in the distance, giving a soft edge. I made sure the road was lighter in the distance and darker in the foreground. The same applied to the sky. Thanks Joe! 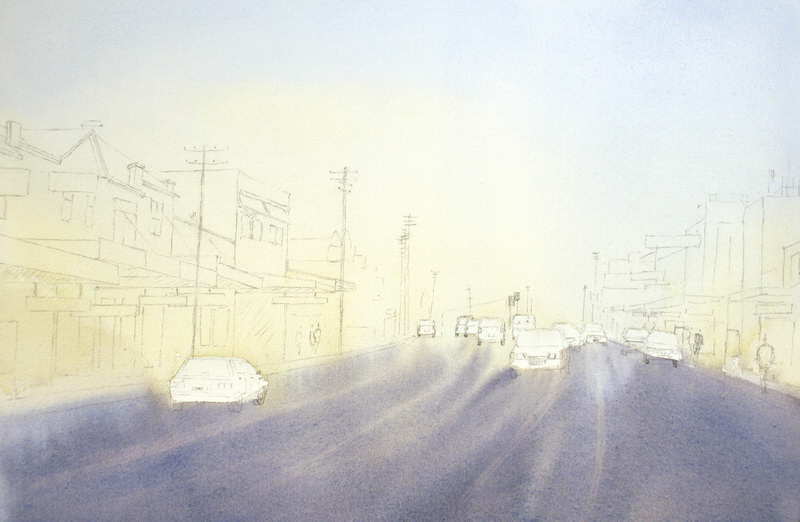 Will work on this under-panting – especially like the advice re leaving highlights on buildings.. Thanks Janelle, glad you liked it. I’m back at Bathurst in July if that is of any interest. Great info- quick question, how do you avoid the sky from becoming green where the blue and yellow meet in the wash? Thanks! Yes that makes total sense, thanks for your help! For all your valuable advice…. Always new things, techniques to learn. Thank you. Thank you Connie, I am glad you get some benefit from my site. Thank you for your information on under painting. It makes a lot of sense and gives the painting that wonderful glow that makes a painting stand out. Can’t wait to try it. I have your first book and will give a hint to my family to buy Step-By-step as a companion to the first. I find your explainations on how to do things easy to understand. Hi Joe, I’m new to your blog but have bought both of your books which have inspired me to try the landscape genre after a bout of botanical painting. I’m trying to prove that you’re never too old to learn. (81yo and 60 years married!). Thanks for a great series of practical tips. Love your work. Hi Peter, One is never too old to learn. Thank you for purchasing my books. Please let me know if you have any questions. I enjoyed reading about underpainting with the atmospheric lighting. Thank you!